Notre Dame’s John Pratt and Jim Snitzer represented the Irish at the Collegiate National Championships in Asheville, NC on May 8-10. As the top 2 DII riders from the MWCCC, the two seniors went into the weekend confident and ready to take on the nation’s best collegiate cyclists. The 3-lap, 75-mile road race took place on Friday afternoon in Marshall, NC, just north of Asheville. There were 4 significant climbs in the first half of the course before a flat last 10 miles along the French Broad River into the finish. By the time the race started, it was extremely humid and temperatures had reached the upper 80s. The conditions made staying hydrated and fueling properly especially important. Both Notre Dame riders stayed near the front of the race during the first lap. Pratt found himself in a small breakaway group that got away for a few miles before being caught at the beginning of lap 2. Snitzer responded to numerous attacks on the next couple climbs and found himself in a select group of 12 that was chasing a few small breakaway groups. With about 20 miles to go, Snitzer made his own attack in an effort to bridge to riders up the road. After being away for about 5 miles with a rider from Mars Hill, the two were caught by the group behind. As they came to the finish, sprinting for 8th place, Snitzer suffered from cramps in his legs, but still managed to finish 16th overall. Pratt also experienced cramping during the last lap from dehydration and lack of electrolytes and ended up 46th. Saturday’s criterium course in downtown Asheville included a large climb and fast descent with a sharp corner at the bottom of the hill. The race was certainly not a traditional criterium. With over half of the field being pulled from the race, it came down to which riders could consistently match the pace up the climb each lap. Another day of hot temperatures made the race even more difficult. Pratt and Snitzer found their way into the second group on the road, only behind the 10 leaders. With about 15 minutes remaining in the race, Pratt put in acceleration on the hill to bridge his way to riders falling back from the leaders. Racing for 11th place the, Pratt slid out on the last turn in the final lap. He quickly remounted and finished 14th, while Snitzer finished shortly thereafter for 20th. Racing returned to Marshall on Sunday for the final race of the weekend, the individual time trial. Pratt posted the early best time of the day, riding the 20km course in 28:40. By the time Snitzer finished with a time of 28:31, the two were sitting in 2nd and 3rd. After all riders had finished, Snitzer was 7th and Pratt 10th overall. Both of them were less than 25 seconds off the podium. It was the final race and proud end to a successful season for Notre Dame Cycling. Thank you to all our sponsors and supporters for a fantastic year. We are already looking forward to the 2016 road season! 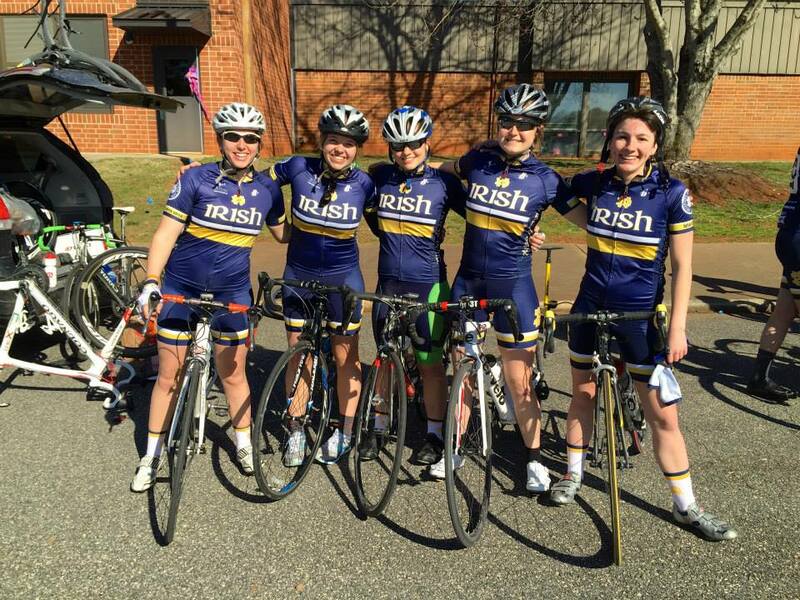 Notre Dame Cycling hosted the Midwest Collegiate Cycling Conference (MWCCC) for the regional championships and the last race of the 2015 regular season this past weekend, April 25-26. On Saturday, the team time trials and road races were held 12 miles north of campus in Niles, MI. Sunday’s criterium was took place just south of the Eddy St. Commons, winding through the newly built Triangle Neighborhood. Saturday morning, both the women’s B and men’s D teams continued their season-long dominance of the TTT to win their respective categories. The men’s B team held on for 4th place, despite being short 2 riders. The men’s A team delivered a 3rd place podium finish only 1 second behind the 2nd placed Lindenwood team and less than a minute behind the winners from Marian. As the rain picked up throughout the day and the temperatures stayed in the mid-40s, riders were forced to battle rough conditions during the afternoon’s road races. D riders John Cerney (Grad.) and David McKenna (Grad.) continued the morning’s success with Cerney winning the race in a field sprint and McKenna taking 4th. In the women’s B race, the Irish scored 4 top 15 finishes. Sarah Cullen (So.) narrowly missed the win, taking 2nd place, while Kelly Valenzi (Fr.) was 4th, Maggie Schmid 9th, and Emma-Kate Conlin 13th. The men’s B squad had a run of bad luck with James Pratt (So.) suffering a flat tire after making the day’s winning breakaway and Tom Frederick (Grad.) crashing out. In the hotly contested 75-mile men’s A race, Jim Snitzer (Sr.) found his way into a chase group midway through the race. His group gained a substantial lead over the main field and he was 7th at the line. John Pratt (Sr.) and Luke Tilmans (Grad.) stayed near the front of the peloton throughout the race and finished 10th and 13th respectively after the field sprint. On Sunday, riders returned for more fast-paced action in the criterium. In the first race of the day, Cerney rode solo off the front for a majority of the D race. Despite being nearly caught by a few riders in the final laps, he sprinted in front of them to take his 3rd win of the weekend. The women’s B squad followed up that performance in the next race, utilizing excellent team tactics to allow Valenzi to break off the front solo. She stayed away with a comfortable lead and notched her first career win. The rest of the team came in near the front of the field with Lillie Romeiser (Grad.) grabbing 4th, Cullen 5th, Schmid 7th, and Conlin 11th. In the men’s B race, Frederick rebounded after the previous day’s crash to take 12th, while Andrew Koch (Grad.) finished shortly behind him in 16th. In the last race of the weekend, the men’s A race, John Pratt made the early winning breakaway of 4 riders. The high-powered group lapped the field before the finish and Pratt sprinted to 3rd place. Tilmans remained in the peloton and luckily avoided a large crash in the final lap to finish 16th. The home race marked the end of a demanding MWCCC season that included spring break training camp and 6 full race weekends. The team finished in 2nd place overall in the final standings, beating out several powerhouse club and varsity teams and only behind reigning national champion Marian. They handily won the title amongst DII teams ahead of Case Western. In the men’s DII individual omnium, Snitzer and Pratt finished 1st and 2nd respectively. The two seniors will represent the Irish at collegiate nationals in Asheville, NC on May 8-10. 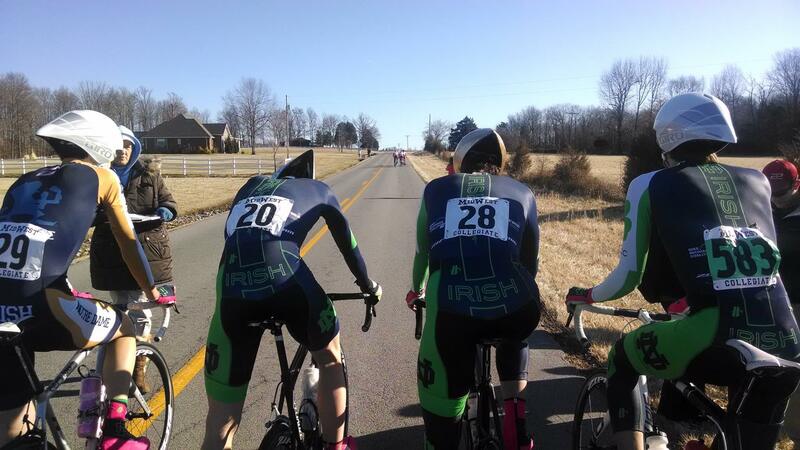 Notre Dame Cycling made the trip to Lindenwood University in St. Charles, MO on April 18-19 for the final away race weekend of the 2015 MWCCC season. In Saturday morning’s 13-mile team time trial, the women’s B squad continued their undefeated streak this season while the men’s B squad took 3rd. The afternoon brought racers to what is probably the toughest road race course in the conference. The loop consisted of 4 significant climbs before a fast, slightly downhill finish. Graduate student David McKenna was the lone D rider for the team this weekend. He took 2nd place, just inches short of the win in the final sprint out of his 3-man breakaway. Sophomore Connor Williams also secured a position on the podium with his 3rd place in the C road race after leading over the climbs for a majority of the race. The Notre Dame women’s B riders stayed near the front of the race during the climbs. In the end, Paige Handy (Jr.) was 5th, Sarah Cullen (So.) 7th, Emma-Kate Conlin (So.) 10th, and Maggie Schmid (Jr.) 12th to earn the team more valuable points towards the season-long team omnium. In the 66-mile men’s B race, Andrew Koch (Grad.) and James Pratt (So.) worked together to stay near the front of a very strong group. They earned 11th and 14th, respectively, in a race that saw over half of its riders drop out due to its difficulty. In the last race of the day, the men’s A field tackled the climbs faster each lap in their 88-mile race. Senior Jim Snitzer worked his way into a select lead group of 8 riders going into the final miles. After his and others’ attacks failed to break up the group, Snitzer finished 4th in the breakaway’s sprint to the line. On Sunday, the action was brought to downtown historic St. Charles for the criterium. The triangle-shaped course included a sharp final turn and a finishing stretch on a brick road. Tight corners and rain pouring down all day made for a nervous day of racing. McKenna rebounded after a crash to rejoin the D field and earn 3rd, his second podium placing on the weekend. In women’s B’s, Schmid also recovered from a crash to take 5th, a career best. Cullen also rode a strong race and sprinted to 4th. Unfortunately, Conlin suffered a mechanical in the final laps and Handy suffered a hard crash that took her out of the race. She is now recovering from a heavily bruised shoulder and fighting to get back on the bike very soon! Graduate student Thomas Frederick was the B squad’s best finisher in the criterium. He attacked with just a few laps remaining but was eventually chased down by the field. In the end, he still sprinted to an impressive 8th place. In the men’s A’s, John Pratt (Sr.) made the early breakaway. However, over-inflated and tread-less tires did not allow him to handle the turns as quickly as other riders. After a promising start to the race, he was forced to drop out of the race for his safety. He finished 24th, while Snitzer was 30th. The Cycling Irish will host the MWCCC regional championships this upcoming weekend on April 25-26. The team goes in leading the conference in the DII team Omnium and vying with Lindenwood for 2nd place amongst all teams, only behind Marian. Men’s A riders Jim Snitzer and John Pratt are 1st and 2nd respectively in the DII individual Omnium. The Notre Dame cycling team continued its racing season this past weekend at races hosted by Michigan State and Michigan. Despite freezing temperatures in all the races (ranging from 10-30 degrees), the team remained strong, determined, and produced some great finishes. The race weekend started off with MSU’s Get Tough Road Race characterized by its long, winding dirt roads and loose gravel. The Men’s D category was the first off and David McKenna (grad.) rode to a strong third place finish by beating out a few other riders in the final sprint. Scot Stanulis (Fr.) competed in his first collegiate cycling race and shows great promise for future racing. The Women’s B team followed shortly after and had some great results with Handy earning 2nd, Valenzi 4th, and Cullen 6th after the Irish trio initiated the days winning 7-woman breakaway. Next up were the Men’s B’s, represented by Thomas Frederick (grad.) and James Pratt (So.). Both were riding strongly in the field until mechanical mishaps got in the way. The dirt roads proved unlucky for Fredrick as he flatted only 15 miles into the race. Pratt was powering on until a painful cramp prevented him from finishing. The Men’s A race was a success with Snitzer (Sr.) securing an impressive 8th after breaking away in a chase group in the final lap. Tilmans (grad.) took second in the field sprint to earn a solid 15th in his first race back this season. The afternoon continued with the individual time trial that consisted of a fast 6.8 mile course. There were multiple strong finishes across the board for the team. For the Women’s B category Handy placed 1st, Cullen 2nd, Valenzi 5th (despite a flat tire in the last 200 meters), and Maggie Schmid (Jr.) 6th. Frederick rode to a strong second place in the Men’s Bs, only 13s off the winner’s time. Snitzer recorded a personal best on the course and finished 3rd in Men’s As. Action continued on Sunday in Michigan’s criterium held in Ann Arbor. Chilly temperatures and wind picking up throughout the day made for some exciting racing. The Men’s D’s kicked off the race day for the team with a successful 7th place finish by McKenna who was aided by teammate John Cerney’s (grad.) work to keep him towards the front of the race. Ryan Green (Fr.) recorded his best finish of the year with a solid sprint finish. Scot Stanulis (Fr.) also showed promise for the D squad, making his racing debut. The Women’s B’s took to the crit course next. After a timid and slow first lap, Handy and a rider from Marian broke away together. The two stayed away from the main field and Handy ended up taking 2nd. Valenzi and Cullen continued comfortably in the pack with Valenzi winning the pack sprint for 3rd place and Cullen with 5th place. Sarah Bueter (Fr.) and Schmid, competing in her first-ever mass start race, both rode into the top 15 as well. In the Men’s B’s, the race stayed together as a pack until the final sprint. Pratt was in good positioning for the sprint, as he was first into the final turn. He unfortunately dropped his chain coming out of the turn and fell towards the back of the pack. Luckily, Frederick finished well in the sprint, earning 7th. The Men’s A race proved exciting for all watching and competing due to the constant breakaway and chase groups forming and dissolving. Snitzer worked his way into the breakaway group of 7 that finally managed to stay away. With 4 laps to go, his group lapped the main field and the two groups merged. Tilmans helped keep Snitzer towards the front going into the final turn. In the end, Snitzer was 6th and Tilmans 16th in a powerful Men’s A field. Despite the painfully cold temperatures, it was a successful second weekend of racing in the MWCCC for the Notre Dame cycling team. The team sits in second place overall in the conference, ahead of all other division II programs and only behind reigning division I national champion Marian. The team will be back in action the weekend of April 11th and 12th at Purdue University. 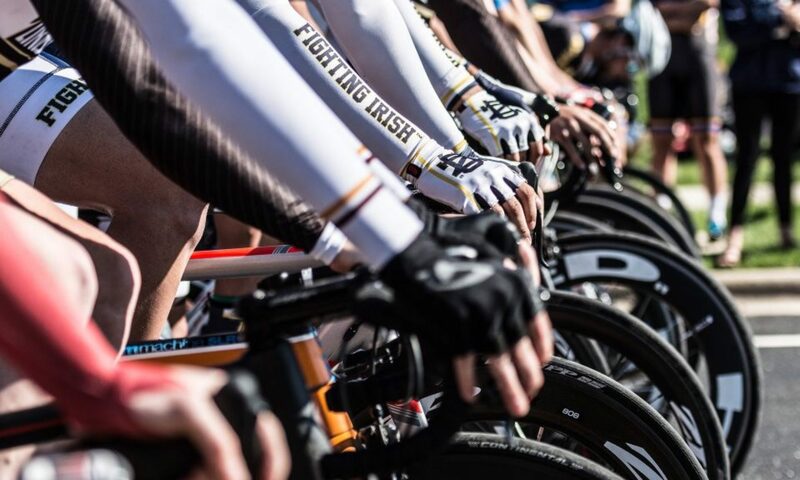 The Notre Dame Cycling Team returned to action this weekend at the first conference race of the season at Lindsey Wilson College in Columbia, KY. While there was a lot of great racing over the weekend, there were also some bad crashes suffered by riders from other schools. Notre Dame Cycling sends our thoughts and prayers to all riders injured in Sunday’s road race, especially to Lindsey Wilson rider Hannah Hayduk, who was taken to the hospital in critical condition. Heal up fast and know that you have the support of the whole collegiate cycling community! The racing kicked off with a team time trial on Saturday morning. The women’s B team of Sarah Cullen (So. ), Paige Handy (Jr.), Lillie Romeiser (Grad. ), and Kelly Valenzi (Fr.) rode to their second victory of the season. Their time was so fast that they beat several varsity teams and would have taken 2nd place in the A category. The men’s D squad was plagued by a flat tire early on but still took 3rd in their race. Mechanical difficulties also plagued the men’s A team during their ride, but they managed a 10th place finish. 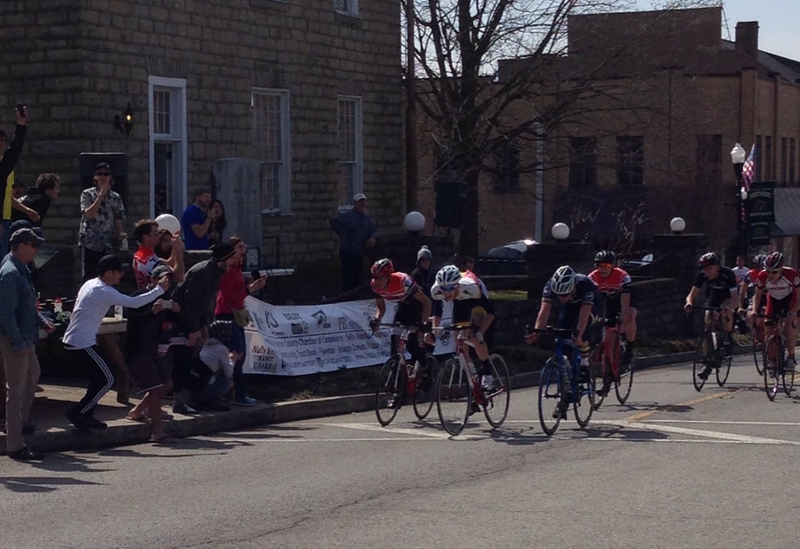 Saturday afternoon brought high-speed criterium racing to downtown Greensburg, KY. The course was new for 2015 and consisted of a small hill on the front stretch with a fast but bumpy descent on the back half of the course. The women’s B team continued on their success from the morning. Handy, Cullen, and Romeiser went 3rd, 4th, and 5th respectively. Unfortunately Emma-Kate Conlin (So.) and Valenzi were also poised for top finishes but removed from contention by dropped chains late in the race. In the men’s D race, David McKenna (Grad.) impressively rode to a top 15 finish in his first-ever criterium. David Berno (Jr.) finished right behind the winner in 4th place, beating a few opponents by a bike-throw at the line. In men’s As, an 8-man breakaway formed halfway through the race. Jim Snitzer (Sr.) attempted to bridge the gap but was caught after several laps by the main field. John Pratt (Sr.) rode steady at the front of the peloton and finished 12th to earn some valuable points in the A race. Sunday concluded the weekend with a very eventful day of road races. The course was the classic 25-mile, hilly loop that Lindsey Wilson has used for the past several years. However, the start-finish line was moved from a hilltop to a downhill section. Shortly after the racing began, there was a large crash in the women’s A field. A few riders suffered serious injuries, and, as a result, all races were suspended until riders could be attended to and the course cleared. After about an hour delay, the races were re-started. Connor Williams had the best finish of the day, rebounding from crashing on Saturday in the criterium to get 2nd in the men’s C race. The women’s B team rode to several more top 10 finishes with Handy taking 3rd, Cullen 4th, Romeiser 6th, and Valenzi 9th. Tom Frederick (Grad.) and James Pratt (So.) rode strongly in the men’s B field with Frederick recording a personal best 8th place finish after breaking away from the main field in the final miles. In the men’s A race, which was reduced by one-lap due to the re-start, Pratt was poised in the lead group with a shot at taking the victory in the final sprint. He made the mistake of starting his sprint a little to early, but still managed to finish a very impressive 7th place. Overall, despite some bad luck with mechanical failures, it was a successful start to the MWCCC season. The team will return to action next weekend in races at Michigan and Michigan State. To start off the racing season, the University of Notre Dame cycling team traveled to Clemson University in South Carolina for an out-of-conference race in the SECCC. The race weekend (March 8/9) began with a hilly road race consisting of 25 miles for Men’s C/D and Women’s B/C, 39 miles for Men’s B, and 77 miles for Men’s A. The course consisted of ~13 mile loops, including a decently sized 250ft climb. The morning had a cold start, but warmed up beautifully by the Men’s A race. David Berno, Conner Williams, Ryan Green, and John Cerney represented the Men’s C squad in the road race. The pack mostly stayed together, yet on the back of the second loop breakaway and chase groups emerged. Williams managed to catch a spot in the chase group and pulled away with a 7th place finish. Berno finished top 15. Green, Williams, and Cerney all made their debut in collegiate cycling and performed strongly. Sarah Cullen, Sarah Beuter, Kelly Valenzi, Emma-Kate Conlin, and Paige Handy represented the Women’s B/C in the road race. The pack managed to hold together until the second lap. Going up a steep ascent, the Men’s B group came up behind the women and jumbled the women’s pack. At that point, a group of 5 girls broke away and chase group began which included Handy. Handy placed 6th with Cullen finishing quickly after. It was the first road race for both Beuter and Valenzi, and they both showed promise for the rest of the season. Conlin also performed strongly throughout the course. Andrew Koch and Tom Frederick represented the Men’s Bs in the road race. The pack held together throughout the race until the final ascent. Koch and Frederick both finished in the midst of the pack and show promise of upgrading to Men’s A’s by the end of the year. Jim Snitzer and John Pratt raced for the Men’s A in a competition of endurance and high speeds. Both rode strong and gained some notable finishes (16th and 18th). A breakaway group appeared in the first lap of the course. Pratt gained a solid spot in a chase group while Snitzer rode solo and eventually bridged the gap to join Pratt in the chase group. Overall, all team members had a solid first race for the season. Saturday afternoon the team competed in 3 individual time trials (5 miles) and 3 team time trials (10 miles). John Cerney (C/D), Jim Snitzer (A), and Sarah Cullen (B/C) all raced in the ITT. Cullen flew through the course and captured a 4th place finish, while even passing a few Women’s A riders. Snitzer’s legs were drained from the road race yet he managed to pull through strong and without injury. Frederick, Berno, Green, and Williams joined together to race for the Men’s B TTT. Frederick and Williams pulled away and worked as a two-man team for the second lap of the TTT. All put out an impressive effort and earned a joint 4th place finish. Handy, Valenzi, Beuter, and Conlin joined forces to earn a first place finish for the Women’s B TTT. It was the first ever first 1st place finish for a Women’s TTT in Notre Dame history. All four members put out their best efforts despite some tired legs from the road race earlier in the morning. Sunday, all members competed in the crit which lasted 30 min for Men’s C/D and Women’s B/C, 45 min for Men’s B, and 60 min for Men’s A. The Men’s C/D proved for an eventful race for the team. In the first lap of the race, another rider came into contact with Green and he took a significant fall from his bike. The crash resulted in some bad road rash on both sides of the body and a cracked helmet, but Green emerged in good spirits. Berno as well got pushed of the course by another rider and took a fall into the grass. He had no injury to himself, but his bike tires needed replacement. After taking his free lap, he was able to rejoin the race. Williams conjured up yet another impressive 7th place finish. Williams will be upgrading to C’s in the near future. The Women’s B race went great for both Cullen and Valenzi. Valenzi pulled a 7th place finish while Cullen as well pulled a top ten finish. All members finished strong and have gained some experience riding with fellow teammates. Frederick raced alone for the Men’s B crit and came through in the middle of the pack. He appeared strong and determined throughout the race. The Men’s A race proved distressing for the team as beloved rider John Pratt took a nasty fall and gashed his thigh on the chain ring of another rider’s bike. A rider from another school had swiped across the field knocking over a few riders, including Pratt. Pratt was smiling and positive throughout the event, despite having to go straight to the hospital for stitches. Snitzer managed to avoid numerous crashes and ended up finishing in the main field. Overall, the race weekend was a great opportunity to get outside on the road again to get a feel for the bikes after a long winter on trainers and spin bikes. The team is spending the rest of the week riding the hills of northern Georgia and building up team camaraderie. Although the race is just a starting point for the season, it revealed some promising results for a great season of racing ahead. The team will compete at Lindsey Wilson March 21/22 for the first race of the year in the MWCCC. Notre Dame, IN– The 2015 road season will soon begin when we head down to Clemson, SC for an out-of-conference race in the SECCC on March 7-8 during the first weekend of spring break. We will then head to Blairsville, GA for a week of training in the mountains of North Georgia to prepare for the rest of the season. Defense of the MWCCC DII Team Omnium Title will begin on March 21 at our first conference race at Lindsey Wilson. This year’s team has a lot of promise with returning men’s A riders John Pratt, Jim Snitzer, and Luke Tilmans leading the way. The women’s B squad will have more depth than any other in Notre Dame history and the other men’s categories have many strong new additions. Stay posted here for updates throughout the 2015 racing season. John Pratt– 2014 MWCCC DII Individual Omnium champ and member of the 3rd place Nationals DII Team Time Trial. Watch out for the #PrattAttack this year. James Pratt– He’s just a sophomore and may seem nice, but watch out for that sprint!